How to order and Quilling Wonderland's policies. You can buy some of my works in my Etsy store, but if you are interested in something different, and you can not find it in my store, do not worry I do custom work. Just contact me to discuss the details. Paypal is my preferred payment method ( it is the fastest and safest way to send money). For custom orders, I require a 50% deposit to be paid in advance and the rest upon completion. For in stock items, a full payment should be made at the time of purchase. In both cases, I will ship the items only after the full payment is confirmed. I ship via STANDARD POST. This shipping does not have any tracking numbers. If you prefer REGISTERED POST or any different kind of shipment simply let me know. If you want to check your shipping cost please visit An Posts Calculate the Postage Page. Please note that I ship from Ireland and depending on your chosen shipping method, you must allow enough time for delivery. Usually it takes from 5 business days up to 7 business days, but it may wary depending on the destination country. All my items are packed securely in recycled materials. If you do not want me to use the recycled packaging please let me know in advance. If for some reason you are dissatisfied with your purchase, a refund can be made if items are returned in their original condition but will not include buyers postage costs. If an addressee does not accept / pick up a package and the order is shipped back to me, a buyer covers repeat shipping costs. Please note that the buyer is responsible for any customs or import duties imposed in their country. If you have any questions, please check with your local customs organisation. Please bear in mind that all my items are handmade. There is no possibility to make two items identical, that is why each of my works is one of a kind. The making process is very time consuming, so you have to remember that the time needed to complete an order depends on the complexity of each design, and it is raging from 3 days up to 2 weeks ( it also depends on how many orders I have at the moment). 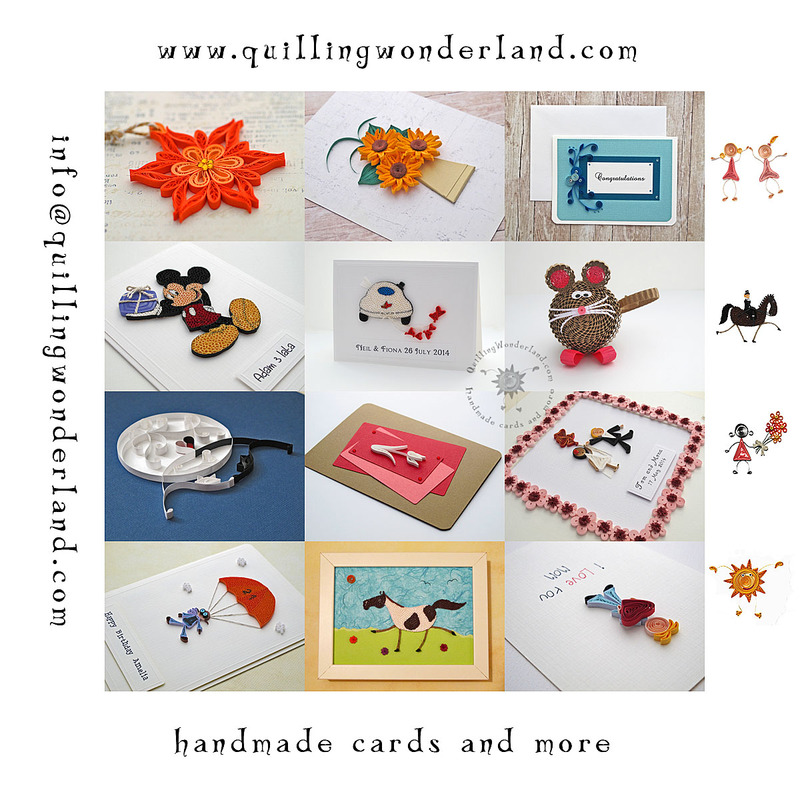 If you have any doubts, fell free to contact me ( info[@]quillingwonderland.com ).